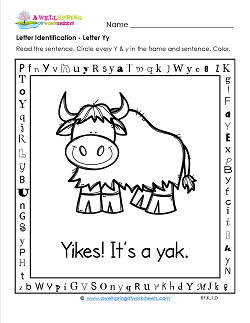 Go to this page if you’re interested in seeing even more alphabet worksheets. 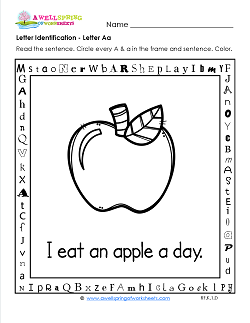 Ever seen a worksheet with an picture of an apple? It's so perfect we had to frame it! Find all the A's in the frame and the sentence and color. What a big, bright and happy bear! 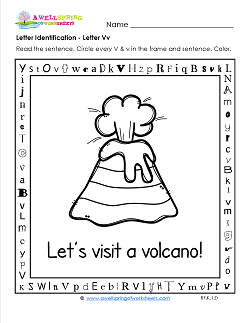 He's pictured on this letter recognition worksheet with a frame of letters. Can you find all the B's? There's plenty! 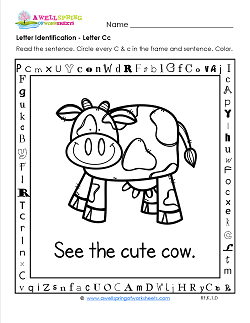 "Mooooo, moooo" says the cow pictured on this letter recognition worksheet. Find all the C's and circle them. Can you find the hidden sight word, too? 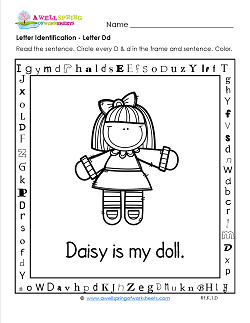 Daisy the doll is pictured here to help you find every D on this worksheet. She's in a frame with all kinds of letters on it. Can you find the D's? 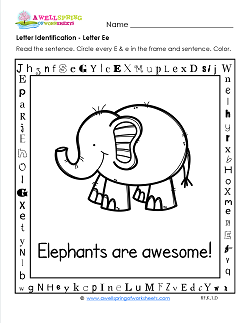 Don't go away because this awesome elephant is eager for you to stay and keep him company looking for letter E's. Hint: There's over 12 of them. 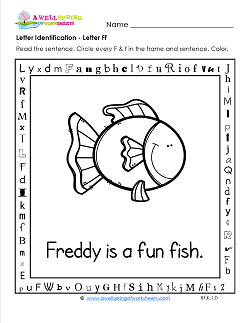 We found a fun little fish for this worksheet. His picture is in a frame with all kinds of letters on it. Find and circle the letter F and have fun coloring him in. Gotta have a green gumball? Step right up to this letter identification page. 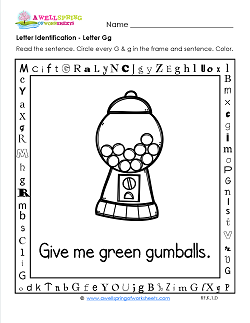 A gumball machine is pictured in the letter frame. Find the G's and circle them. 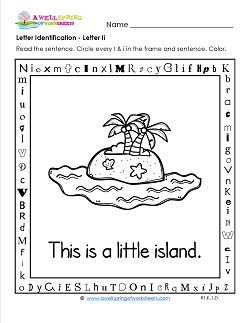 A little island is pictured in a letter speckled frame in this worksheet for recognizing letters. Kids find all the I's in the frame & sentence & circle them. "The jam is in a jar." 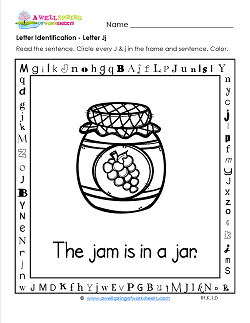 is the sentence pictured with a jar of jam on this letter identification worksheet. Find every J - there's over 12 of them, and color. Have you ever seen a picture of a kind king? 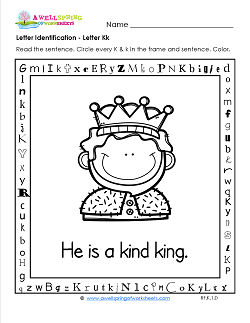 Well, go ahead and click on this page to see the one on this worksheet for the letter k. Find & circle every K, then color him in with kindness. Oh, this big fella is so eager for you to give this worksheet a go! Find all the L's and circle them, then color this larger than life furry friend. Feeling a bit cold? 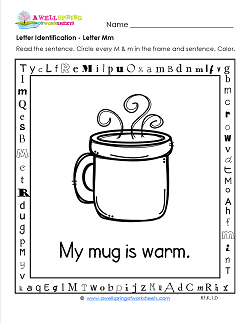 This worksheet should warm you up! Find circle all the M's in the sentence and the picture frame. How many did you find? 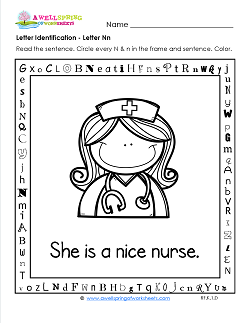 With a picture of such a nice nurse, how could you not have a nice time with this worksheet? Find the N's and color her pretty. :) Did you notice a hidden sight word? 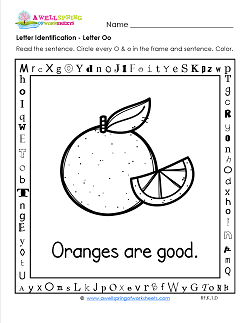 This worksheet for identifying the letter O is serving up something sweet...an orange of course! Find all the O's and color the orange...orange, of course! 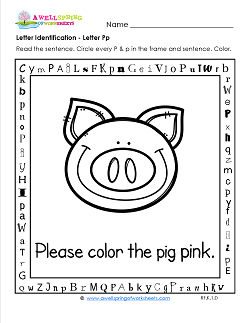 There's a pretty happy pig on this identify the letter worksheet for the letter p. He's eager for you to search for and find every p on the page! Then you can color him pink. 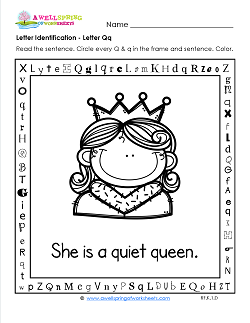 Letter recognition for Q is quite quaint with the picture of the quiet queen. Find each q in the picture frame and the sentence and color the queen. 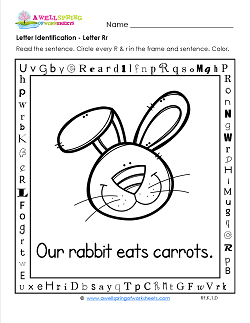 Step right up and see this letter recognition worksheet for the letter r! Kids search for the letter in the picture frame and the sentence about a pet rabbit. S is for sailing a sailboat on the sea. 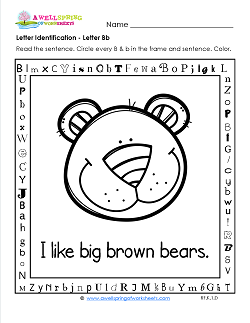 And it's for this letter s recognition worksheet! 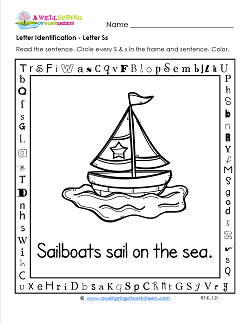 Find every simple and silly s, circle it, and color the sailboat and the sea. 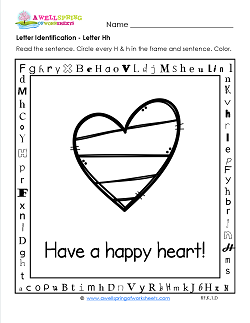 Your kids are sure enjoy this letter t recognition worksheet. 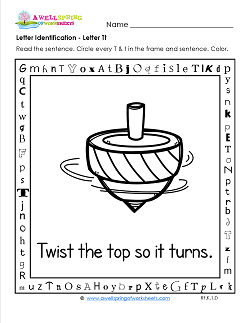 They find and circle the letter in the frame and the sentence and color the spinning top. 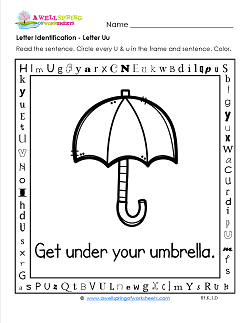 Recognizing the letter u is the order of the day on this worksheet. Find and circle every u (they're in different fonts) and the hidden sight word. Color the umbrella. Honing in on your skills for recognizing letters? This is the best spot for working on your v's. Find every v (and the sight word "to") in the frame and the sentence and circle them. 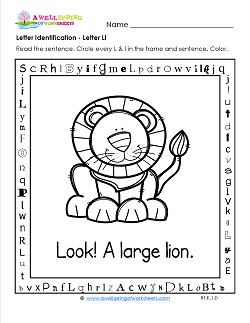 Identifying the letters is the first order of business in this letter w worksheet. Find and circle every w in the frame and the sentence. Color the picture. 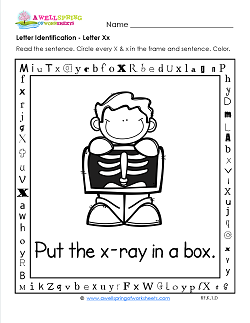 Will you be able to find every x (& the sight word "be") in this recognize the letters worksheet? I'll be you can. The letters form a frame and the picture has an x-ray. 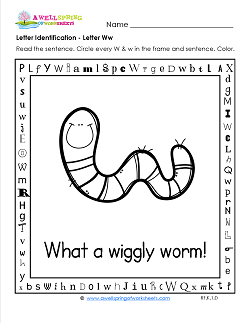 Kids will have a ton of fun with identifying the letters in this worksheet. Can they find every y? Circle them all. Look for the sight word "so" in the frame, too. 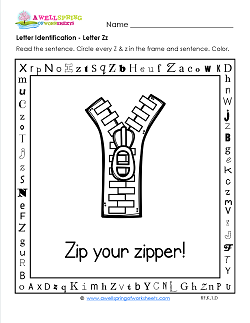 A cool letter recognition worksheet for z. Kids look for and find every z in the picture frame and the sentence and then color. Can they find the sight word "he", too?